Sciency Thoughts: X-ray Computed Tomography studies of two Woolly Mammoth calves from Russia. X-ray Computed Tomography studies of two Woolly Mammoth calves from Russia. The Woolly Mammoth, Mammuthus primigenius, is thought to have diverged from the earlier Steppe Mammoth Mammuthus trogontherii in northeast Asia around 700 000 years ago and by 200 000 years ago spread across Asia and into Europe and across the Bering Strait into North America, where they hybridized with the Columbian Mammoth Mammuthus columbi. They are believed to have been the last surviving species of Mammoth, persisting to as late as 3700 years ago on Wrangel Island, off the northeast coast of Siberia (with some claims of even more recent specimens). As a widespread and apparently numerous species living in the recent past they have left an extensive fossil record, primarily of isolated teeth and bones, but also including a number of mummified and frozen specimens, trapped within the Arctic permafrost. These have allowed a number of detailed anatomical and molecular studies of the Woolly Mammoth, although many were excavated in the nineteenth and early twentieth centuries, and have subsequently degraded due to poor storage facilities, preventing the application of the most modern methods to these specimens. 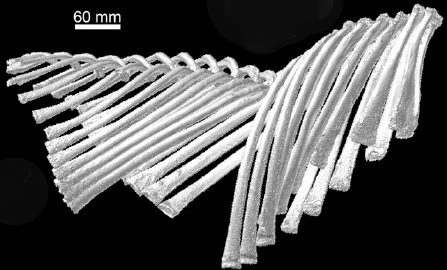 In a paper published in the Journal of Paleontology in July 2014, a team of scientists led by Daniel Fisher of the Museum of Paleontology at the University of Michigan describe the results of a series of X-ray Computed Tomography studies of two recently discovered Woolly Mammoth calves from permafrost in the Siberian Arctic. 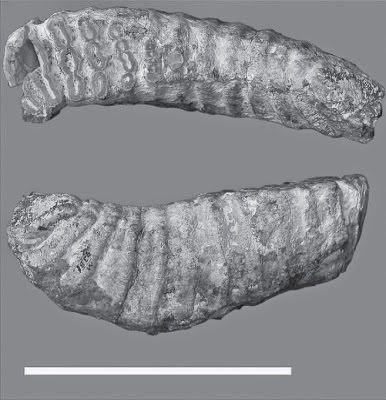 The first specimen, named Lyuba, was found in May 2007 by on a bank of the Yuribei River on the Yamal Peninsula, where it is believed to have been deposited by an ice-melt flood the previous spring. When found it was almost intact, having lost only its hair and nails, however it was transported to a nearby village where it was partially scavenged by domestic Dogs, losing part of the tail and right ear, before being acquired by the Shemanovskiy Museum and Exhibition Center in Salekhard in the Yamalo-Nenets Autonomous Okrug of the Russian Federation. Here the specimen was found to be partially dehydrated, having lost approximately half of its expected water content, and found to be female by examination of the urogenital tract, and subsequent DNA analysis. Lyuba’s body was found to have been acidified, probably by colonization of the corpse by lactic acid-producing Bacteria, leading to the degradation of much of the connective tissue (collagen). The facial region was found to contain numerous masses of vivianite (hydrated iron phosphate). Examination of Lyuba’s teeth was able to find a neonatal line (produced at the time of birth) followed by 30-35 daily growth increment lines, setting her age at the time of death at 30-35 days. She appears to have been healthy and well fed at the time of her death. An isotopic analysis of the age of the body suggested an age of about 41 800 years. Lyuba was subjected to a full CT scan, then examined endoscopically through two holes drilled in her left side. She then underwent two necropsy sessions, in which her body was thawed, partially dissected then refrozen. In the first the teeth were removed from the left side of the face, and portions of the large and small intestine were also extracted. In the second the pleural and abdominal cavities were examined. At this point it was determined by the Shemanovskiy Museum that the body would need to be treated chemically to prevent further decomposition, and allowed to dehydrate fully. Fisher et al. were unable to access the original CT scans of Lyuba made at the Shemanovskiy Museum before chemical treatment. However they were able to take the body to the GE Healthcare Institute in Waukesha, Wisconsin, where it was possible to scan the Mammoth’s head and neck and a portion of the right forelimb and (separately) her pelvic region and left hind limb (the entire Mammoth was too large to fit into the scanning equipment at Waukesha). 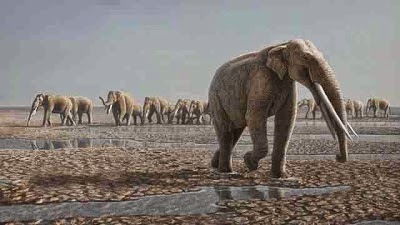 A complete scan of the Mammoth’s body was later made at the Nondestructive Evaluation Laboratory of the Ford Motor Company in Livonia, Michigan (as far as Fisher et al. are aware this is the first time a Mammoth has undergone a complete full-body scan in this way). Unfortunately industrial scanners like the one at Livonia are slower than medical models, and only seventeen hours were available for the scans on Lyuba, so the resolution achieved was not as high as hoped. Micro CT scans of the extracted teeth were carried out at the University of Michigan Dental School in Ann Arbor, Michigan. Lyuba was already known to have significant sediment lodged within her trunk. Her oral cavity (mouth) was also filled with sediment, although this matched the bank sediment at the site by the Yuribei River where she was found, so it is assumed that this was emplaced during the recent transportation of the body. The second necropsy carried out on Lyuba was able to determine that her lungs had collapsed, and that larger bronchial cavities were filled with a bright blue powder identified as vivianite with some clay minerals. The CT scans revealed that Lyuba’s trachea was also filled with material which had the same density as the material in both the trunk and lungs, suggesting that all three are the same. Fisher et al. suggest that Lyuba died after inhaling mud which blocked her trachea and the front part of the bronchial system in her lungs, preventing her from breathing and leading to suffocation; this matches the distribution of sediment seen in the trachea and lungs and the collapse of the other lung tissue (in the alternative scenario, drowning, sediment would have spread throughout the lungs, which would not have collapsed. It is impossible to assess where this happened, as the body had been transported prior to its discovery, but fine-grained vivianite is typical of lake-bottom sediments. 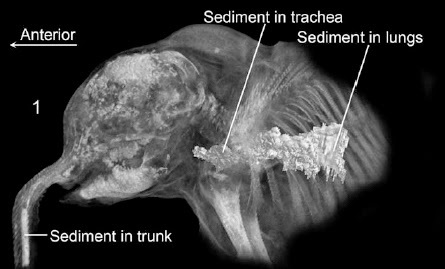 Aspirated sediment in the Mammoth calf Lyuba, sediment with a radiodensity in the range of bone can be traced from the pharyngeal region,through the trachea, and into the lung bronchi (from the Ford scan). Fisher et al. (2014). The first vivianite detected on Lyuba was found on her left side, which was the side she was laying on when discovered, wher a number of circular pit where filled with bright blue material. This is interpreted to have been caused by fungal growth, which has previously been documented on a number of other specimens of similar age, including the ‘Blue Babe’ Steppe Bison mummy and the Tyrolian iceman ‘Otzi’. However vivianite was also found in nodules throughout the facial region of Lyuba, and within the diaphyses of her long bones (the growing ends of the long bones in a young mammal), where a better explanation was needed. Fisher et al. suggest that this is connected closely to the manner of Lyuba’s death. If she did asphyxiate on lake bottom sediments, then it is likely that she was in a cold, wet environment suffering from oxygen deprivation immediately prior to death. Mammals in such circumstances have a ‘diving reflex’, whereby blood is withdrawn from the skin and extremities, but the supply increased to the face and brain, thereby keeping the animal alive as it tries to escape its predicament. Vivianite is an iron-phosphorous mineral, and needs a supply of both elements to form. In the case of the facial nodules the iron comes from blood pumped to the head as Lyuba struggled for her life, while the phosphorus comes from the dissolution of bone tissue by the action of lactic-acid forming Bacteria after her death. In the case of the long bone diaphyses the iron would have come from bone marrow, which is particularly rich in iron in these areas of bone growth. 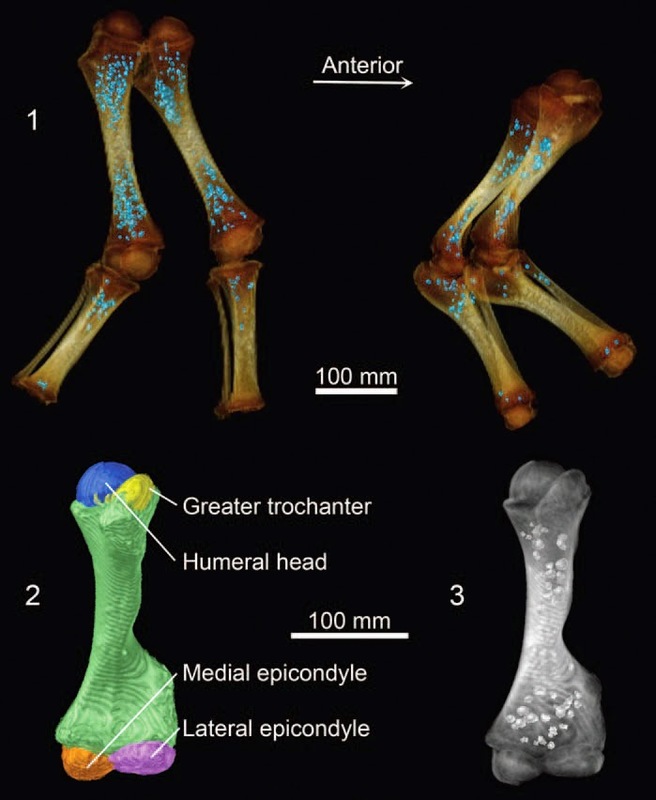 Larger elements of Lyuba’s appendicular skeleton (without maniand pedes) extracted from the Ford scan: (1) radiodense nodules withindeveloping trabecular spaces in long bones are probably vivianite crystalsformed from bone-derived phosphate and blood- and marrow-derived iron;bones show radiodensity disparity between diaphyses and epiphyses; rightlateral aspect, hind limbs on left (right ahead of left) and forelimbs on right(right ahead of left); (2) left humerus in anterior aspect,diaphysis (green) segmented separately from epiphyseal ossifications(labeled); (3) segmented radiodense nodules show through cortical bone of diaphysis (humerus unsegmented in this image so that nodules show through);common scale for 2 and 3. Fisher et al. (2013). Lyuba’s ribcage had been laterally compressed (squashed from the sides) after death, with the greatest amount of deformation occurring on the left side. Her backbone is intact, and appears to be in life position. Her skull is also slightly deformed and compressed, which may have been aided by partial dissolution of the bone by lactic acid. The second Mammoth calf, Khroma, was found preserved in situ, upright in permafrost near the Khroma River in northern Yakutia in October 2008, and subsequently excavated and shipped to the Mammoth Museum at the Institute of Applied Ecology of the North at North-East Federal University in Yakutsk in the Sakha Republic. At the time of discovery it had been partially eroded from the sediment, and parts of the head trunk and shoulders scavenged by Ravens and (possibly) Arctic Foxes. Thus, while in generally good condition, the body had lost much of the trunk, the flesh from the head, the fatty tissue from the back of the neck (where a fatty hump would be expected) and the heart and lungs. DNA analysis showed Khroma to be female, which was subsequently confirmed by CT scanning of the urogenital tract. A necropsy revealed she had abundant subcutaneous fat, and undigested milk in her stomach. It was not possible to determine the age of Khroma isotopically, suggesting she died more than 45 000 years ago. Khroma was also subjected to two rounds of CT scanning, first at the Centre Hospitalier Universitaire de Clermont-Ferrand, then at the CentreHospitalier Emile Roux in Le Puy-en-Velay, both in France. Her teeth were also extracted and micro CT scanned at the at the University of Michigan Dental School in Ann Arbor, Michigan. Examination of Khroma’s teeth enabled the detection of a neonatal line, followed by at least 52 daily growth increment lines, although these were somewhat unclear, leading Fisher et al. to conclude that she was 52-57 days old at the time of her death. Khroma’s age, determined from her right dP3: (1) right image shows lingual aspect of a slab cut from the right dP3, anterior to the left; (2) enlargedview of the anterior root in 1; the dark line running vertically, parallel to the pulp cavity surface, is the neonatal line (NnL); (3) photomicrograph of a thin sectionof the anterior root, with pulp cavity (pc) surface at right, neonatal line (NnL) at left, and 52 or more daily dentin increments (small white dots) between them; (4) enlargement of area designated in (3), showing increments for last 18 days of life. Fisher et al.estimate Khroma’s age at death as 52–57 days. Fisher et al. (2013). Elephants walk on a thick pad of fat with a thick layer of skin over it. The distal phalanges (bones at the tips of the toes) are believed to help distribute weight evenly within this structure, though exactly how this works is unclear. In African Elephants only the third and fourth toes have ossified (bone) distal phalanges, with these elements in the other toes being cartilage, while in Asian Elephants the distal phalanges of toes two, three and four are ossified. Attempts to resolve the number of ossified distal phalanges in Mammoths have been, to date, unsuccessful, largely as the limb tips are seldom preserved intact. Khroma was preserved with her feet undamaged, making analysis of the ossification state in the distal phalanges a possibility. Unfortunately no ossified distal phalanges could be detected, nor was it possible to detect ossification in the metatarsal-phalangeal sesamoid (known to ossify in Woolly Mammoths), suggesting that Khroma was too young at the time of death for complete ossification of all the bones in the foot to have occurred. However it was possible to detect the synovial capsules in the foot (fluid filled capsules that form between bone-bone joints in Mammals, but not bone-cartilage joints), as these had lost their fluid but filled with (distinctly less dense) air. This suggests that the second, third, fourth and fifth distal phalanges may have ossified. 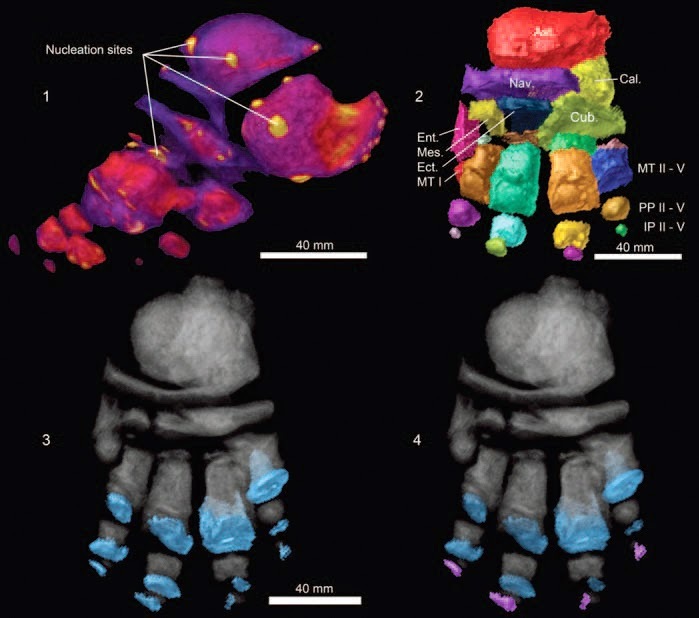 Khroma’s left hind foot: (1) lateral aspect, anterior to left,showing nucleation sites and epiphyseal ossification center on calcaneumtuber at right; (2) anterior aspect; (3) anterior aspect, synovial joint capsules ondigits, light blue; (4) anterior aspect, non-terminal joint capsules light blue andterminal joint capsules purple. Abbreviations: Ast., astragalus; Cal., calcaneum; Cub., cuboid; Ect., ectocuneiform; Ent., entocuneiform; IP, intermediate phalanx; Mes., mesocuneiform; MT, metatarsal; MT I, metatarsal I (red); MT V, metatarsal V (blue diaphysis); PP, proximalphalanx. Separate scales for 1 and 2; common scale for 3 and 4. Fisher et al. (2013). Khroma’s skeleton was more damaged than Lyuba’s, with some of the ribs broken by recent scavenging, and a break between the seventh and eighth thoracic vertebrae, which occurred at about the time of death. Khroma is thought to have died of sediment inhalation in a similar way to Lyuba, but this break suggests a much more violent setting (the backbones of even very small Elephants are quite robust). Fisher et al. suggest that she may have been caught in a mud flow or bank collapse, which caused a significant lateral impact as well as burying her and preventing breathing. Khroma’s ribcage in right lateral aspect (interruption of rib sequence caused by break in vertebral column). Fisher et al. (2013). The Dwarf Pachyderms of Crete, Mammoths or Straight-Tusked Elephants? What Nitrogen tells us about the diet of Mammoths. Elephant trackways from the United Arab Emirates. Follow Scieny Thoughts on Facebook. A new species of Fanged Frog from Sarawak. A new species of freshwater Goby from Sulawesi. Asteroid 2014 WH6 passes the Earth. The origin of the ‘King of Flowers’. Melbourne woman swallowd by 3 m sinkhole. Asteroid 2014 WF201 passes the Earth. Nine new species of Crab Spiders from Africa. Eruption on Mount Fogo, Cape Verde. A parasitic Heterakid Nematode from Sulawesi. A new species of Wormshrimp from the Maldives. Giant sinkhole opens up in Perm Region of Russia. An unusual Pucciniomycote Fungus from Ecuador. A Galliform Bird from the Oligocene of Poland. Diptocarp wood from the northwest of India. Breeding behaviour in a Fanged Frog from Vietnam. Two new species of Leafhoppers from China. Two new species of Tortrix Moths from Thailand. The demise of the Megashark. A new species of Leopard Frog from New York City.